Successful business owners know that the best advertising is word of mouth --- a recommendation from someone known and trusted. After that, the next best is from a trusted resource. LCP is dedicated to providing only the highest quality information and has gained “trusted resource” status. 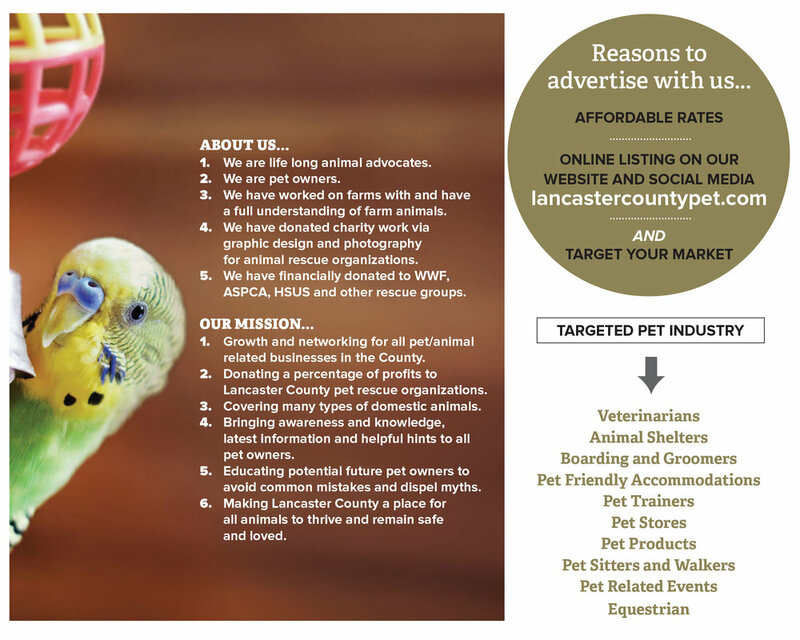 As a mainstay in the homes of pet and animal owners throughout Lancaster County, it has become “known and trusted.” Businesses that promote the launch/rise of LCP will share in that mission. To obtain a Media Rate Card with information on ad sizes, rates and deadlines, please contact sales@lancastercountypet.com or call 717.406.7811. I just wanted to congratulate you and your Team on an outstanding Spring issue 2016 of Lancaster County Pet Magazine! The articles and photos continue to be excellent and it’s exciting to see the support from new advertisers. Keep up the great work! On behalf of the pets, THANK YOU!